In order to digest your food properly, your body must be in parasympathetic mode, or in a state of non-stress. Kindergartners know this. Well, they might not know the scientific term yet, but during lunch they participate in 6 minutes of silence; a period they call "Mindful Eating". 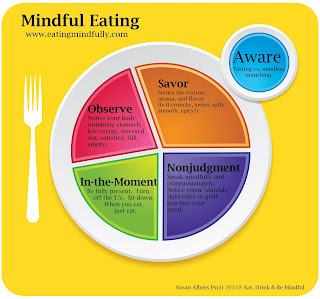 When asked why they like mindful eating, the children replied, because "it’s quiet”, “I can enjoy my food better”, “I get peace and quiet”, and "it’s calmly”. Kindergartener teacher Ms. Scrima, and other Kennedy School teachers have been implementing mindfulness in the cafeteria and their classrooms since last year. They are proud to have a lunch period that looks and sounds quite different from the chaotic cafeteria rush other classes often experience. While the students sit silently at the lunch table checking in with their emotions, their digestive systems are also benefitting. Physiologically, only when our bodies are in rest mode can the brain trigger the release of digestive enzymes, which breakdown our food into absorbable nutrients. If we are constantly in a state of stress, our food will not be broken down properly, which can lead to digestive ailments and nutrient deficiencies. Think about why some cultures say a prayer before a meal, or sit on the floor to eat…these are ways of turning the "rest switch" on. By getting our students to relax before and during eating, we are helping their lunchtime truly become a moment for nourishment. If you are interested in incorporating mindfulness into your daily life or classroom activities, visit the Kennedy Mindfulness Team’s webpage, and follow their 7-week mindfulness program. Do you practice mindful eating at home or school? If so, please share your techniques!